If you are interested in getting the best Omron blood pressure monitor, but you have too little time on your hands to run thorough research on your own, here you will find the information you seek. Our researchers examined all the critically acclaimed products and concluded that the Omron BP742N should be the first to be considered by buyers. This model is designed to store 50 readings for each of the two users that can be accommodated at the same time, offering you the possibility to monitor the changes in your blood pressure. The blood pressure monitor will also compare your readings with normal ones, and give you information on irregular heartbeats. A quick start guide is supplied with your purchase. 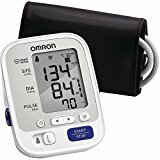 In case the Omron BP742N is no longer available, the Omron Auto Blood Pressure is our next recommendation, for its excellent features. This unit offers two users the option to monitor their blood pressure, and also stores the information on the latest readings. The device can store in its memory the last 50 readings for both users, which is a very helpful feature, especially when the blood pressure has to be monitored for a specific period. Moreover, the device compares the readings with normal values and lets you know of any irregular heartbeats. You cannot get a different cuff for this device, in case the original one does not fit properly. A perfect, easy way to monitor the evolution of your blood pressure. The blood pressure monitor comes with a simple design for comfortable use. You can use it with one-touch operation, this feature being appreciated by many users. This unit comes with a contoured arm cuff which can fit arms up to 13 inches in circumference. It can detect irregular heartbeats, and its memory can store the last 14 readings, allowing you to keep a close eye on your blood pressure progress. Some customers would like an AC adapter instead of the AAA batteries, or at least AA batteries. This is a sleek, light and simple to use blood pressure monitor. You can obtain accurate results with this device, and know exactly when it is time to visit your cardiologist. The cuff can fit arms between 9 and 17 inches, making it very comfortable to use. This unit will immediately let you know if there are any irregular heartbeats during measurements. In addition, you also get 14 memory slots for the last 14 readings, making it easy to follow your blood pressure evolution. A few owners mentioned that the cuff tightens too much and leaves marks on the arm. If you need an easy-to-use blood pressure monitor, this is a good option. You might feel challenged to pick the right model produced by this company since there are so many available for sale. We want to help you by providing you with a list of products that have managed to accumulate a large number of favorable reviews from buyers. Are you in the market with the purpose of finding some excellent gifts for grandparents? The Omron BP742N should be on your list, as it provides two users the possibility to monitor their blood pressure and store information on the latest readings. This device offers each of the two individuals the possibility to see their latest 50 readings, which are stored in the memory of the device. This can be particularly handy as it allows you to notice any changes. Even more, the device compares these numbers with what is considered to be the normal values and can let you know of irregular heartbeats. You will not have to depend on a single reading at a time. This particular model has a clever feature that calculates the average of three readings taken within 10 minutes. This way, you will not have to worry whenever you see a reading that seems slightly abnormal. Several accessories are provided with your purchase. The D-ring cuff wrap serves for comfortable measurements and will fit an adult’s arm with ease. You will also get a quick start guide that will show you how to use the device correctly, a full instruction manual, as well as 4 AA batteries. You may notice that many of the reviews of Omron blood pressure monitors include this particular model when they mention the ones that are worth the money. 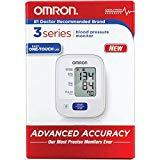 A part of the Omron 3 series, this blood pressure monitor is really easy to use and can help anyone who needs to supervise their health at home with accurate readings. The unit has a straightforward design, and it is comfortable to use. Its one-touch operation helps in this respect, and many buyers appreciate it particularly for this reason. The device comes with a contoured arm cuff that can accommodate an adult’s arm of up to 13 inches in circumference. You may also like to know that the device is compatible with a large cuff, too, in case the one delivered with your purchase is not a good fit. The comfort and convenience provided qualify this product among the must-haves you should buy for home-based health monitoring. A great thing about this blood pressure monitor is that it can detect irregular heartbeats. This way, you will know when it is the right time to see your doctor. The memory of the device will store the last 14 readings for easy comparison. After a certain age, it would be a good idea to start monitoring your health with the use of a blood pressure monitor and even invest in some senior exercise equipment, to keep in shape without putting yourself in jeopardy. The Omron BP710N provides accurate results for your blood pressure readings, so you can know exactly when you need to see your cardiologist. This model comes with a cuff that can fit on an adult’s arm with a circumference as small as 9 inches and as large as 17 inches. This will make taking measurements more comfortable, and you will appreciate the ease of use that the device provides. If there are irregular heartbeats during measurements, the device will let you know right away. You will also get 14 memory slots for 14 readings, to notice quickly any changes. It uses 4 AA batteries, but you will have to purchase these separately. Omron is a company with a long-standing reputation of making blood pressure monitors, and this model is another proof of their dedication to providing their clients with the easiest to use devices that also offer accurate readings. Don’t neglect your health and start watching for signs of illness using top-notch medical devices like this one. There are several outstanding aspects of this blood pressure monitor from Omron that we need to talk about. For instance, this model comes equipped with the TruRead technology that makes the average from three different readings taken within 10 minutes. This way, you can rest assured that the data you are looking at is as accurate as possible. Comfort is essential for seniors, from the use of a wheelchair cushion when they have to spend long hours using such a device, to the use of a comfortable cuff for taking blood pressure. You will be glad to learn that the ComFit cuff available is created with the user’s comfort in mind. It is quick to adjust and offers you the possibility to position it correctly. You can use this one for people with average and large arms with the same ease. The screen on which the reading results will be displayed comes with a backlight, which let you see the data even in low light or dark conditions. The display also has large digits to allow seniors to read the data with ease. One of the awesome features of this model is that it can store the last 200 readings. Multiple users can take advantage of this feature. With a history of making blood pressure monitors of more than 40 years, Omron continues to be dedicated to offering their clients the most precise devices. The Omron 7 Series comes with a few good reasons why you should consider it for home-based health monitoring. For instance, it stores 100 readings, along with their timestamps, allowing you to notice any changes quickly. Also, you will get an accurate reading, calculated by taking your blood pressure three times over 10 minutes. This way, you will not have to worry about the device misbehaving or offering you misleading information. One of the things you will appreciate about this model is the ultra-silent operation when you inflate the cuff. This will let you take measurements in all sorts of conditions, without drawing unwanted attention. The Heart Zone Guidance feature will activate the device when the wrist is at heart level. You will get a complete kit with your purchase, made of a storage case, 2 AAA batteries, a quick start guide, and a comprehensive instruction manual. The device can detect irregular heartbeats and warn you about the necessity of seeing a doctor. When you compare Omron blood pressure monitors, you will find that some features are the same, while others are different. This can be helpful when you need to find a product that is right for you. The device will read both your blood pressure and your pulse, and the whole process will take mere seconds. The results are shown on a digital display that is easy to read. Why should you take your blood pressure at home and not at a doctor’s office? The simplest reason is that you might get stressed when you’re visiting your doctor, and that can influence the accuracy of your readings. The cuff the device comes with can fit an arm with a circumference of 9 inches, and it can go as up as 13 inches. The cuff must be placed around the arm and then inflated. You should not worry that you might feel uncomfortable during this operation. It will all take only seconds, and you will see the results displayed on a digital screen. If you need this device for a patient with bigger arms, this model also works with a larger cuff. The only downside is that you will have to consider buying this cuff separately. If you want a blood pressure monitor that will help you take your measurements anywhere you are, you will surely appreciate the Omron 3 Series unit. This model is lightweight and compact. When you are traveling, or you want to measure your blood pressure even if you are not at home, you will be able to do so with the help of this particular model. You will be alerted right away if your blood pressure reaches abnormal levels, and another great thing about this unit is that it can alert you of irregular heartbeats immediately. These are aspects to bear in mind when you need to monitor your health closely. The device is capable of storing your last 60 readings, something that can provide you and your doctor with essential information on your evolution. The readings will be saved in the memory of the device with their dates and time stamps so that you doctor can see when noticeable changes have taken place. You will get accurate readings when using this particular model. It works by automatically calculating the average from three different readings registered over the duration of 10 minutes. This way, you will not have to fret over abnormal readings that might be incorrect. Aging comes with its problems, and seniors often have to take care of their health, by using osteoporosis treatments, specialized medicine for various illnesses, and employing medical devices to monitor their health. The Omron HEM 907XL is ideal for watching blood pressure, and can give you good indications in regards to your health and when it is the right time to see a doctor. Accurate measurements are essential for someone who is trying to keep an eye on their health. This model calculates an average of three readings to give you the final one within a time frame of 10 minutes. This way you will not be fooled by a temporary rise in blood pressure levels. One of the things you may like to learn about this model is that it comes with its AC adapter and a rechargeable battery is also supplied with your purchase. Unlike other models that need disposable batteries to work, this one can save you some money in the long run. You can use this model for monitoring your health at home, but it serves to know that the Omron HEM 907XL is designed to be used by physicians, hospitals, and clinics, hence its outstanding accuracy and overall quality. One of the first things that must be mentioned about this particular model is that it comes fitted with a large cuff. For people with larger arms, this is the right option to consider. The cuff will accommodate people with 13-17 inch arms, as the circumference is measured. People who are overweight can take advantage of this model. Another thing that will draw your attention when you compare this model to others is the large display. As is the case with other products meant for seniors, such as a walking stick, having the right size matters and you also need to look at any extras that might be provided. The large screen, for instance, will allow you to read the pulse and blood pressure values quickly. The cuff will inflate to the right level as the IntelliSense will remember what you consider comfortable, thus offering you the possibility to use this medical device with ease. This is a straightforward product and will offer you the possibility to read your blood pressure in the comfort of your home. Bear in mind that it cannot replace a visit to the doctor’s office, but it can give you an idea of when you need to see a healthcare specialist. It can be challenging to find the right medical devices to use at home, so, in this buying guide, we would like to come to the rescue and help you decide which Omron blood pressure monitor is best. This company creates various blood pressure monitors, each one equipped with unique features and functionalities. After reading our guide, you will have a better idea which model to pick. The most important role of a blood pressure monitor is to offer you accurate results so you can tell when it is the right time to see a doctor. Many Omron models come with a feature called TruRead whose primary role is to take three readings over the span of 10 minutes and calculate the average. Your blood pressure can be influenced by a lot of factors, and that is why multiple readings are recommended. Instead of going through the tedious process of measuring your blood pressure, writing the readings down, and then having to calculate their average, the best Omron wrist blood pressure monitor will do all this work for you. The accuracy of measurements is essential from multiple points of view. If you need to transmit information to your doctor, it will not serve to supply your physician with inaccurate data. Also, you don’t want to get alarmed for no reason, as some readings may point out elevated blood pressure, due to external factors. Taking your blood pressure measurements can be very helpful, but, again, to keep track of all the readings you get using such a medical device, you will need to keep a diary. With the hectic lives that many people lead today, that may not always be an option. You might forget to write down a specific reading, for one reason or another, and you might not be accurate in monitoring the situation. Again, a good quality Omron blood pressure monitor will come to the rescue. Their most advanced models can store up to 100 readings, 50 for each of the two users that can utilize it, and that feature is something that will come in handy when you need to monitor your health over a long duration of time. A model such as the one described earlier is top of the line, but, in case you don’t need your machine to remember so many readings, there are plenty of other options to consider. Some models that offer the same accurate readings can store only 14 readings, which is enough for someone who maybe doesn’t want to pay for the extra memory storage. Various other models with different storage memory capabilities are available. It is up to you to decide which one is the best fit for what you have in mind. You will find that many Omron blood pressure monitors cater to different tastes and needs. If you are looking for gifts for retired men, one of the products made by this company might be the right present to purchase for someone you know. One important issue to address when you go shopping for such medical devices is the size of the wrist cuffs. Omron makes several such models, and they mention, in their specs, what wrist size can be accommodated. While there are arm-style models, many people prefer the wrist blood pressure monitors for their convenience and ease of use. Whenever you are in the market for a blood pressure monitor, don’t forget to take a close look at the specs regarding the wrist size that can be accommodated. Again, Omron does a swell job of covering a broad range of users, and you will find models that come with large wrist cuffs, or that can accommodate this type of cuff. These blood pressure monitors we are talking about here are automatic, and they need batteries to function. Depending on how much you are willing to spend and what kind of model you prefer, you will find that there are options available for everyone. Many of the Omron models you will find right now work with disposable batteries. Triple-A or double-A batteries are the most common choice, and for some models, the manufacturer doesn’t hesitate to supply the buyer with batteries, too. Of course, the most significant downside to disposable battery models is that, in the long run, you will have to spend money on new batteries, over and over again, even if you get a few of them with your purchase. However, you should bear in mind that rechargeable batteries are usually used for high-end models. These models are even used by hospitals and clinics, and you can expect the highest level of quality. However, you might not need to use your blood pressure monitor that much, and that might not justify the initial investment.